Apple is set to launch its streaming video and updated news service at a special event in the Steve Jobs Theater in Apple Park at 10 a.m. Pacific, 1 p.m. Eastern on Monday. AppleInsider's Daniel Eran Dilger will be there —join us for exclusive in-depth coverage and analysis direct from the event. It's Apple's first media event of the year and AppleInsider's Daniel Eran Dilger is at the Steve Jobs Theater in Apple Park for. Join him and all the AppleInsider team for breaking news and in-depth analysis of what promises to be a huge event. 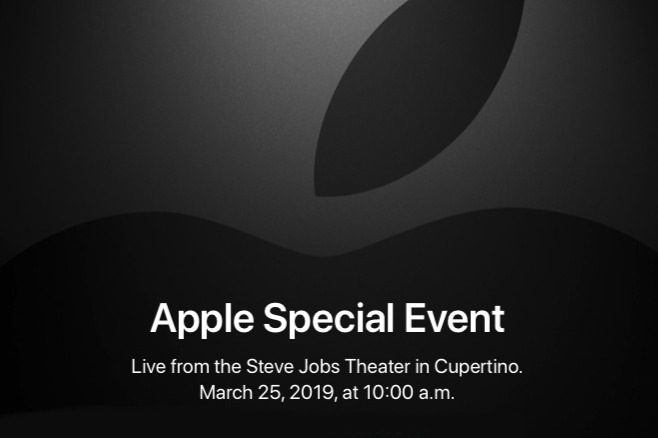 This is when Apple is going to reveal its streaming video service and it's expected the company will also detail its updated news subscription package too. Follow the event live on AppleInsider by signing up to our free Live Blog and get notified when it all kicks off. Following the event, join AppleInsider editors Andrew O'Hara and Mike Wuerthele for a live discussion of the day's events on YouTube. It's show time. Tune in March 25th at 10 a.m. PT to watch our #AppleEvent live on Twitter. For a time before the official start date, Apple streamed what purported to be a live view of the empty Steve Jobs Theater. It showed Apple Maps being used to navigate someone driving to the Theater. Since it ended at 6:45 a.m. PT, the stream has stopped.